Ugadi 2011 (Yugadi 2011) is the Telugu New year and Kannada New year. Ugadi 2011 date is April 4th 2011, Monday. Ugadi 2011 marks the beginning of Sri Khara nama Samvatsara in Hindu Panchangam. Ugadi or Yugadi means the beginning of an era. Hindus in Andhra Pradesh and Karnataka celebrate their New Year as Ugadi whereas the people of Maharashtra celebrate it as Gudi Padwa. In Andhra Pradesh and Karnataka on Ugadhi day, Ugadi Pachadi is prepared and distributed among the people. This festival is also celebrated as Cheti Chand or Sindhi New year. Ugadi Pacchadi is the important recipe made on Ugadi or Telugu and Kannada New Year day in Andhra Pradesh and Karnataka people. It is one of the most famous recipes which symbolize the concept of life with the mixture of six flavors (Shadruchulu). 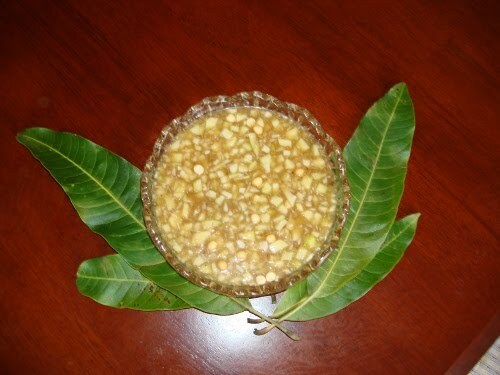 Health wise also Ugadhi Pachadi is very helpful in reducing kapha, pittha, and vaatha disorders. In 2010, Ugadhi date is March 16, 2010. First mix tamarind solution and water. Finely chopped mango pieces are mixed with the above solution. Add neem flowers to it and mix well. Now, you can serve Ugadhi Pacchadi in small quantities as it is considered as Prasadam. Ugadi Pachchadi is the special recipe prepared on Ugadi day in Andhra Pradesh and Karnataka. This recipe signifies the combination of every aspect of life. Ugadi Panchanga Shravanam is done on Ugadi. Astrology predictions and yearly horoscopes are told by Brahmins on this day to common people. Tamil New Year day is celebrated as Puthandu or Chithirai Vishu. Malayalam New Year day is Vishu. The main Malayalam New Year day is Chingam 1 which is celebrated in August. Bengali New Year day is Baisakh or Poila Baisakh. Assamese New Year day is Bohag Bihu. Ugadi of next year, Ugadi 2012, marks the beginning of Nandana nama samvatsaram (Hindu Year 2012-2013).